The Hero finally showcases Ms. Carr for the fantastic storytelling she is. Her ability to weave these 'simple' relationships into this small town setting is one of the reasons i've been such a fan of hers since getting my hands on Virgin Riverseveral years ago. 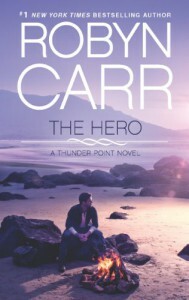 It's no secret that I haven't been smitten with the pervious books in the Thunder Point Series but this one brings us fans back to what makes Ms. Carr so unique and special. 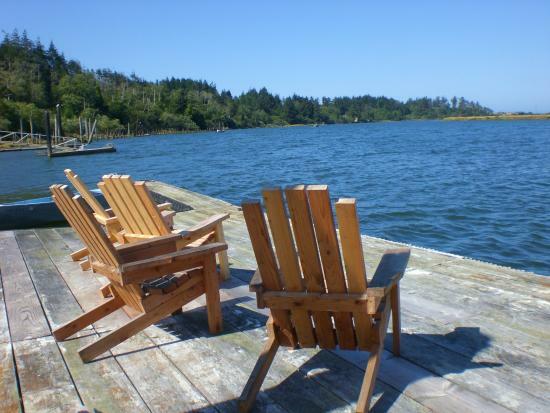 The whole series centers about the make believe town on the Oregon coast, close to Bandon. Where people are friendly, hardworking, real and kind at heart. This backdrop, ocean with people quietly wondering the beach then grabbing a meal at Coopers is packed with small town feel and unity. It's this foundation that gives Ms. Carr the staying power. I often joke with my friend Regina that at time of stress we should just run off to Virgin River (Carr's other series, also set in a small town in Northern California). It's where you wish you lived, if not just for a little bit. In The Hero we get a clearer picture of Thunder Point, where it's situated on the coast and how people keep finding there way here. I really enjoyed that part. The landscape of Thunder Point is going to change with Cooper building along the hill, so imagine sitting in those chairs staring at the hillside while he and Sarah build their home. I have a strong feeling their house wont be the last but the start of many to come. The people of Thunder Point are just regular hardworking folks. They're always welcoming with a smile and a good morning and always willing to help. In The Hero we meet Devon a mother who fled a commune because she's afraid for her daughter, Mercy. They leave the middle of the night and make their way towards the coast. Devon finds herself in Rawley's truck and on the way to Thunder Point. He's really the unexpected Hero of this story and I really enjoyed getting to know the man under all that gruff. Rawley helps Devon and Mercy keep their secret and keep them safe from the Fellowship. Watching Devon transform from this scared woman to one who found strength in a town that stood behind her, was very beautiful to read. Devon puts her life together and in the process finds Spencer a widowed father in the process. You can't help but feel all the wheels working in Thunder Point. Maybe it’s not a choice between either yielding my free will and identity to The Fellowship, or experiencing complete devastation and danger on my own. Maybe there is a place in the middle. There are several side stories that seem to be setting us readers up for future books. Erick, Ashley's long lost father is planning to make a move to Thunder Point. Laine, the woman who helped the other fellowship woman escape. I know there is more in store of her. Plus all the young love, some are getting ready to graduate and leave for collage. Some much potential in the coming books and I can't wait to read where Ms. Carr takes us. Why 3.5 stars... Well, I felt that my standards were set very love coming off reading the Newcomer and although I loved the direction that The Hero went. It didn't blow me away as some of her previous books have. This really was my last try at this series, i'm glad that Carr stuck to one storyline with snippets of other people on the side. I made this book read smoothly and I can't wait for what comes next for the Thunder Point Series. ARC courtesy of Harlequin via Netgalley in exchange for an honest review.